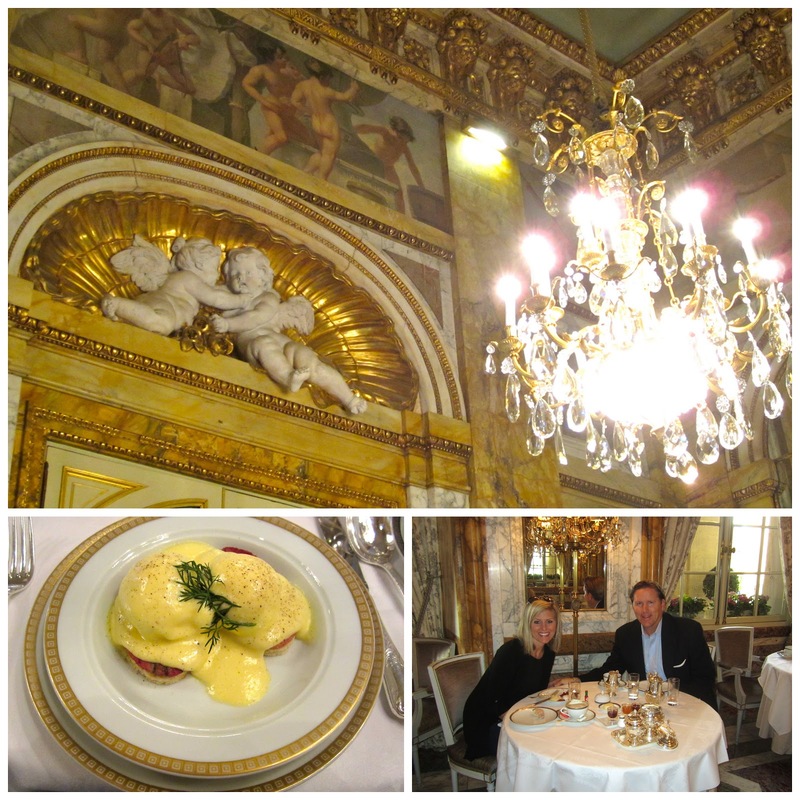 Postcards from Paris: Part Deux! We began our second day in Paris with breakfast at the hotel in the legendary Les Ambassadeurs dining room. The sumptuous space, formerly the Count of Crillon's ballroom, is replete with gorgeous Baccarat crystal chandeliers, ornate frescoes and polished marble that beautifully embody the Rococo aesthetic. 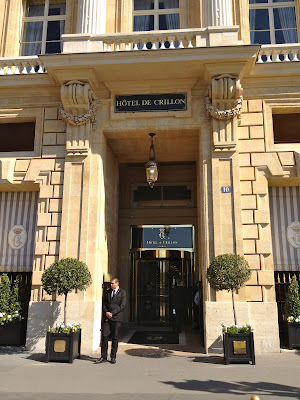 Built in 1758, Les Ambassadeurs has operated as a restaurant within the Hôtel de Crillon since the 19th century. It reached the height of its popularity as a restaurant and night club in the 1870's when it was frequented by the aristocracy and some of the best known figures of the art world. As a result, it has been portrayed in works of art by Edgar Degas and Henri de Toulouse-Lautrec and was also featured in Ernest Hemingway's memoir "A Moveable Feast." In 2011, the restaurant was re-awarded a Michelin star after losing its two star status in 2010 following the departure of Chef Jean-Francois Piege. The very talented Chef Christopher Hache and his team are dedicated to restoring Les Ambassadeurs to its former culinary glory. I have to say they're doing a pretty fabulous job! After breakfast we wandered around the city and came across L'eglise de la Madeleine (Church of the Madeleine), a Roman Catholic Church with a long and complicated history. Razed to the ground at three different points during its construction, it was finally built in the Neo-Classical style envisioned by Napoleon who was inspired by the Maison Carée at Nimes, one of the best-preserved Roman temples. Despite Napoleon's plan to have the structure serve as a memorial to the French Army, King Louis XVIII ultimately decided it would serve as a church dedicated to Mary Magdalene which was finally consecrated in 1842. Further down the street on Place de la Madeleine was Hédiard, a fabulous gourmet grocery store featuring beautiful displays of produce, teas, spices and other gourmet specialties. 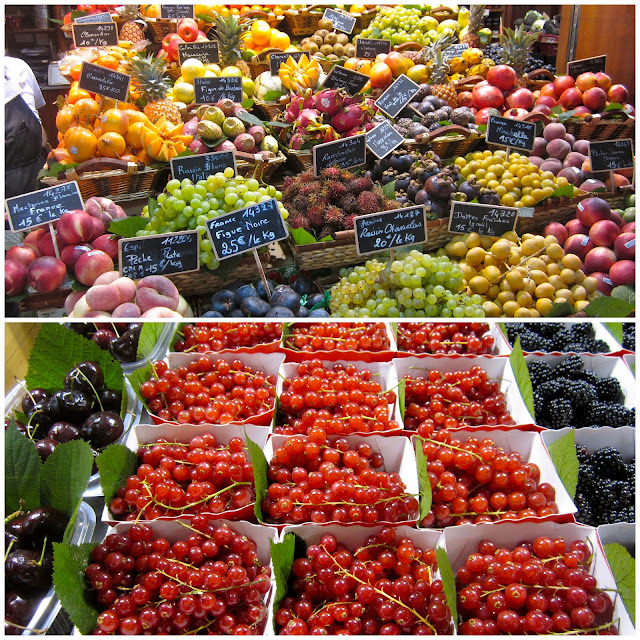 This Parisian gastronomic institution was founded in 1850 by Ferdinand Hédiard and was born out of his love for exotic produce such as lychee, guava and bananas - the likes of which Paris had never seen! This location is Hediard's flagship store and it was from this very place that Hédiard first sold his fabulous produce to the finest restaurants in Paris as well as his loyal customers. He is even credited with providing celebrated artist Eugene Delacroix, a longtime fan, with his first pineapple. The day we were there was actually the first time I had ever seen fresh red currants which looked like beautiful, shiny, ruby red jewels - thanks, Ferdinand! Of course, a trip to Paris just wouldn't be complete without a trip to the mecca of fashion: Chanel! 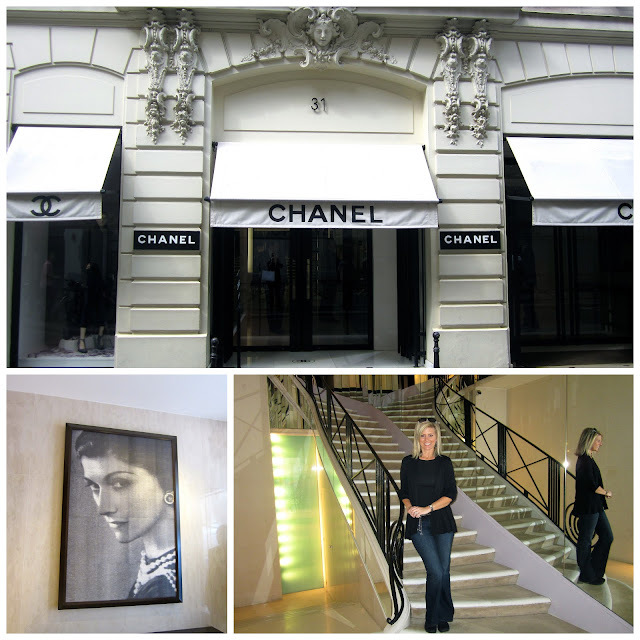 While there are quite a few Chanel stores in Paris, the one located at 31 Rue Cambon holds special meaning because it is also the address of Coco Chanel's apartment which is located directly above the boutique. Mademoiselle Chanel didn't actually live in the apartment (in fact, it doesn't even have a bedroom) choosing instead to live at the nearby Ritz Hotel. Every morning before she crossed Place Vendôme on her way to the Rue Cambon boutique she would call to inform them of her imminent arrival so the staircase of her apartment (pictured above) could be misted with Chanel No. 5 to herald her arrival. I've been trying to get Steve to do that ever since we've been back but so far no luck. What a way to start the day! The biggest Chanel buzz during our stay in Paris was the brand new 6,500 square foot Chanel boutique at 51 Avenue Montaigne. This store makes a total of three Chanel boutiques on this revered street alone! 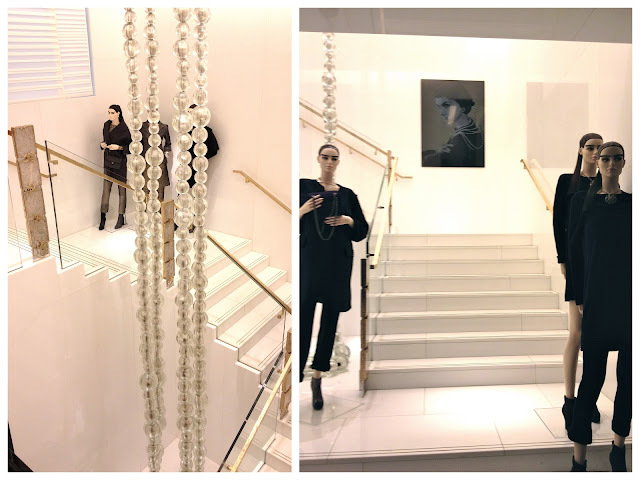 The new store was inspired by Coco Chanel's apartment and echoed similar elements including textured screens, sumptuous fabrics and a gorgeous stairway with gilded railings and a cascade of pearls dripping from the ceiling onto the white marble floor below. When we arrived there was a crowd of paparazzi out front (no not for us!) who were hoping to catch a glimpse of some other shoppers getting their "Chanel on" that day: John Travolta and Kelly Preston. A flurry of activity surrounded their private fitting room while Chanel associates buzzed in and out with armfuls of stunning merchandise. When the couple left, Kelly was wearing a few beautiful new Chanel necklaces and clutching multiple black bags of fabulousness. If John's trying to make up for something I'd say he's definitely headed in the right direction! After our Tour de Chanel we visited the Musee de L'Orangerie located in the western end of the Tuileries Gardens. This museum is home to a treasure trove of Impressionist and Post-Impressionist works by artists including Picasso, Matisse, Cezanne, Modigliani and many more. The museum also represents another Midnight in Paris filming location. If you're familiar with the movie, this is where Gil and Inez accompany Paul and Carol for the private showing of Monet's "Water Lilies." Paul, being the pedantic, pseudo-intellectual, Monet expert that he is, proceeds to school the group on the historical significance of Monet's work. Eight panels of Monet's "Water Lilies", or "Nymphéas" as they are known in France, do reside at L'Orangerie. In 1922 Monet agreed to donate the pieces to the French government with the understanding they would be displayed in specially designed rooms at the museum. However, due to his reluctance to part with them, it wasn't until after his death in 1926 that they were finally installed and displayed for the public. A major renovation took place from 2000-2006 that enabled these historic works to be viewed as Monet had originally intended: under direct diffused natural light. While I was too busy enjoying to take photos of them (sorry!) I did take one of Auguste Rodin's beautiful bronze sculpture "Le Baiser" located on the terrace of the museum. Postcards from Paris: Part Une! Before embarking on a two week exploration of some of France's renowned wine regions, Steve and I spent a few fabulous days in Paris. From food to wine and art to fashion this city definitely has it all! So what to do in this veritable cultural wonderland with only a few short days and so many options? Here's a few of our postcards from Paris. 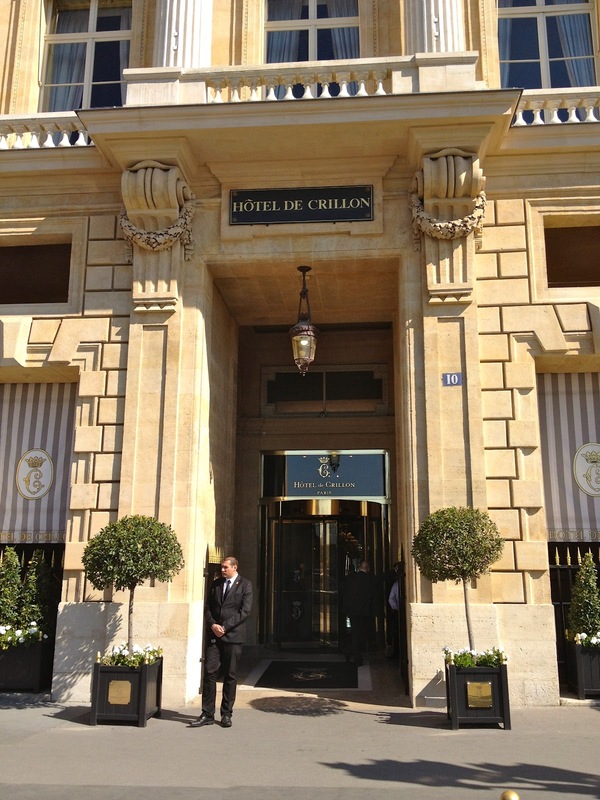 This visit we stayed at the historic Hôtel de Crillon, one of Paris's six Palace Hotels, located on Place de la Concorde. Constructed in 1758 this hotel is located right in the center of Paris and is a great location from which to explore this fabulous city. After arriving from the airport on a Sunday morning, we took a moment to enjoy the gorgeously appointed lobby, a quick glass of Champagne and some delicious pastries then headed straight for the Boulevard Raspail Market located in Paris's 6th arrondissement. 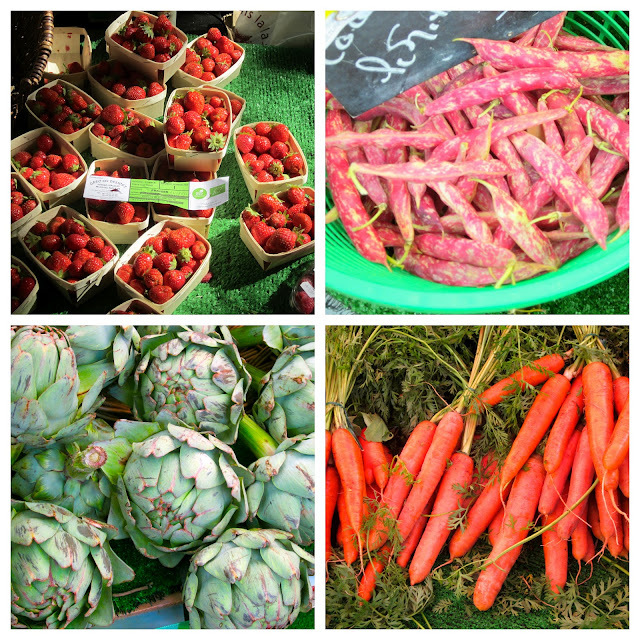 The market is open three days a week and on Sunday becomes one of the city's marché biologiques, or organic markets, which extends from the Rue de Cherche-Midi to Rue de Rennes. 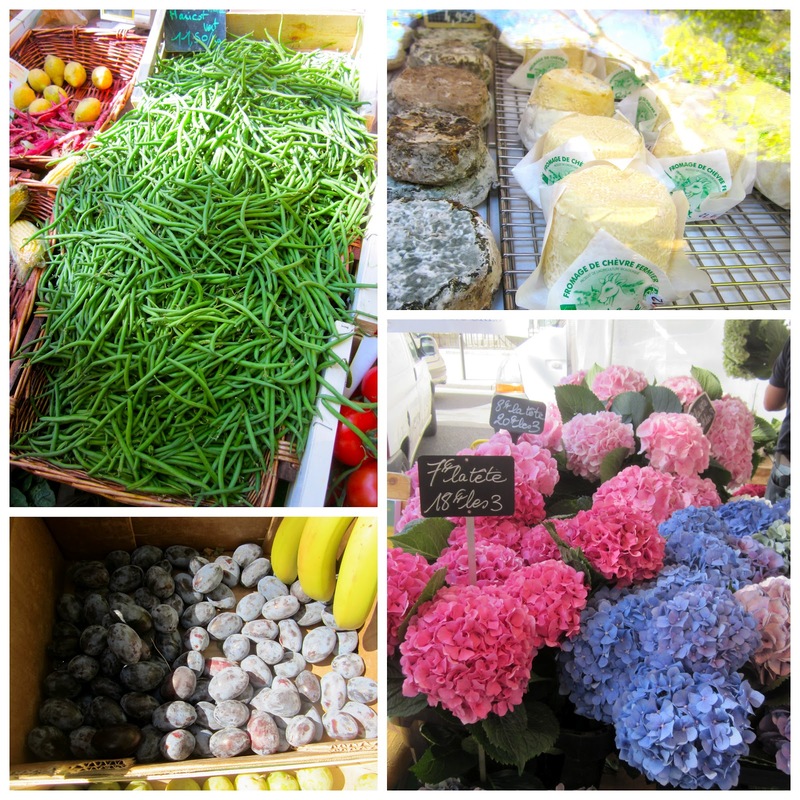 The market featured beautiful stalls of fresh produce, delicious meats, fragrant cheeses and brilliantly colored flowers - it was a feast for the senses! After the market we meandered through Saint-Germain-des-Prés, the charming neighborhood that lines the Left Bank of the Seine and is home to many storied cafés and brasseries such as Cafe de Flore (a personal favorite! ), Les Deux Magots and Brasserie Lipp. 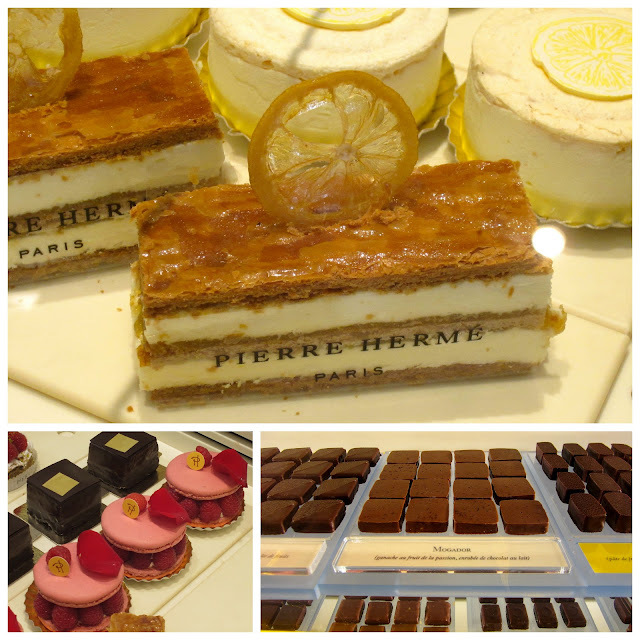 You'll also find an array of specialty food stores including Poilâne, arguably the best bread in Paris, as well as Pierre Hermé, home to mouth-wateringly beautiful confections including a delightful mille feuille and a rainbow of macarons and decadent chocolates. 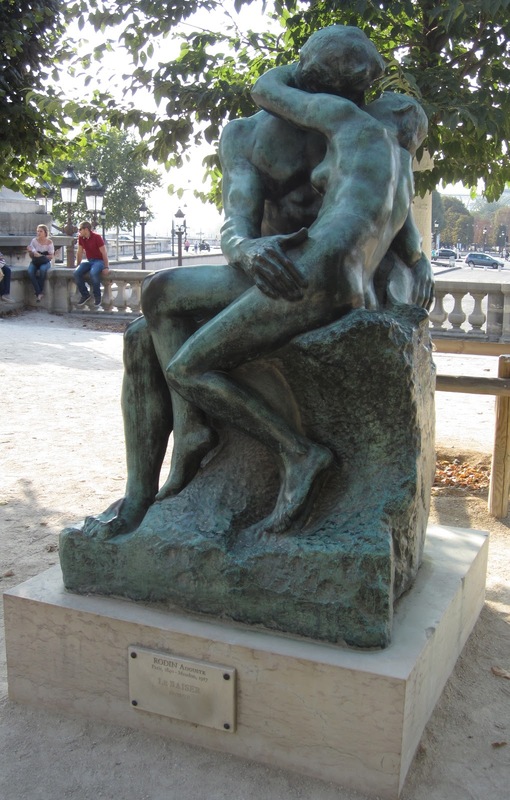 When planning the itinerary for this trip, I was very inspired by the delightful movie Midnight in Paris, written and directed by Woody Allen and starring Owen Wilson and Rachel McAdams. If you haven't seen it and you are a Francophile or lover of Art History, Literature or Music, it is an absolute MUST! I just loved the scene at Polidor where Owen Wilson's character first meets Ernest Hemingway. It is located on Rue Monsieur-le-Prince and actually looks alot like it does in the movie, very Old World quaint. We continued to wander and appreciated having some beautiful weather in which to do our exploring. In fact, it wasn't much cooler than it was back in Florida, but luckily after a few days the temperatures dropped to a more comfortable level. After strolling around most of the afternoon it was time for a mid afternoon nap to try and counter the jet lag. 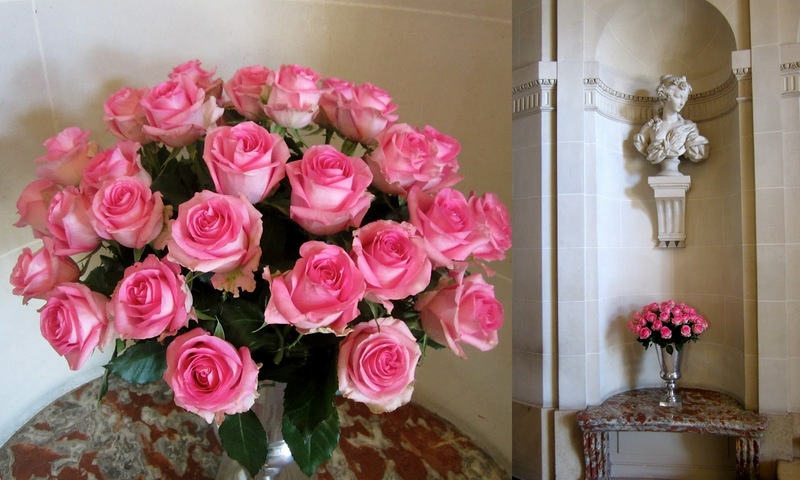 One of my favorite things about the beautiful Hôtel de Crillon were the gorgeous bouquets of pink roses everywhere. The lobby smelled positively divine! Later that evening we decided to do a little more exploring and luckily, we didn't have to go far to find another great location from Midnight in Paris. As it turns out, Maxim's was right around the corner from our hotel. Maxim's is an historic Paris eatery established in 1893 and known for its Art Nouveau decor. It had quite the storied reputation due to its world class cuisine and famous clientele. It attracted a slew of celebrities over the years including Jean Cocteau, Aristotle Onassis, Edward VIII and his wife Wallis Simpson as well as Brigitte Bardot, who caused a scandal in the 1970's when she entered the restaurant in her bare feet. In Midnight in Paris, Marion Cotillard's character Adriana is smitten with the idea of La Belle Epoque Paris. 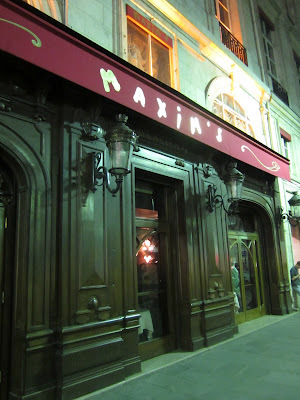 Maxim's is one of the places she desperately wants to visit in order to escape the mundane 1920's.